first superhero team, The Justice Society of America, was his idea. And when the superheroes began proliferating, he created the first superhero parody in comic books. Abigail "Ma" Hunkel, a big, brawny, "no-nonsense" mom, was a prominent supporting character in the "Scribbly" series in the back pages of DC's All-American Comics, when an otherwise good-for-nothing relative hit a longshot at the racetrack. Over the next several issues, she took charge of the proceeds, used them to buy a neighborhood establishment (Schultz's Grocery Store), became the victim of a protection racket, and even saw her daughter, Sisty, and Scribbly's kid brother, Dinky, kidnaped by the crooks — and the police wouldn't lift a finger to help! In All-American #20 (November, 1940), Scribbly remarked that if Green Lantern were around, he'd take care of the situation — and then had to explain who Green Lantern, who had debuted in All-American's lead position a mere four months earlier, was. By the end of that episode, the criminals found themselves up against a big, brawny, "no-nonsense" superhero — The Red Tornado — no, not, as she frequently found it necessary to point out, "tomato". The Red Tornado wasn't quite the first female superhero in comics — depending on how you define them, it's possible she was beaten into print by as many as six (Fantomah, The Woman in Red, Invisible Scarlet O'Neil, Miss X, Lady Luck and The Black Widow, all of whom languish in obscurity). But she was certainly the first to masquerade as male — the other characters in the series all thought she was a man, and she didn't correct them. She wasn't, however, the first cross-dressing superhero  that honor, such as it is, goes to Madam Fatal. But she was the first to use red flannel long johns as a prominent costume element, thus paving the way for Supersnipe, Captain Klutz, The Fat Fury and many others who made that fashion statement. She concealed her identity by cutting eyeholes in an old pot and using it for a helmet. Other pieces of the costume were odds and ends she found around the house. In All-American Comics #24, The Red Tornado was joined in "his" crusade against crime by a pair of sidekicks, The Cyclone Kids — in reality, Sisty and Dinky, who had no idea Ma was their hero, and decided to become "mystery men" on their own. Before long, crime was virtually extinct in their neighborhood, and The Red Tornado had to broaden her horizon. She attended the first meeting of The Justice Society of America, but was prevented from joining by an unfortunate accident (she tore her pants on a nail, and had to beat a hasty retreat). She also appeared in a few early issues of Comic Cavalcade, where the cover-featured stars were The Flash, Green Lantern and Wonder Woman. 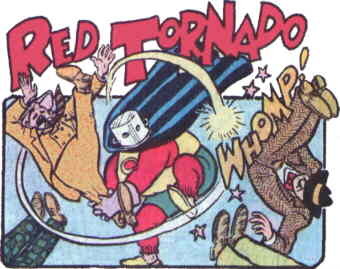 It was in All-American #23 that The Red Tornado became the official co-star of the series. "Scribbly & the Red Tornado", with Scribbly's name getting progressively smaller and The Red Tornado's larger, remained in the All-American back pages until #59 (July, 1944). But by 1948, when Scribbly was brought back in his own comic, superheroes no longer dominated comic books, and The Red Tornado was not brought back with him. But another character called The Red Tornado actually did become a Justice Society member, and has since gone on to become a minor but enduring DC supporting character. As for Ma herself, she spent decades in a witness protection program. When, in 2004, the last crook with a vendetta against her died, she came back out, and is now manager of a museum devoted to the JSA. Text ©2001-09 Donald D. Markstein. Art © DC Comics.